Step one in creating a child's biblical worldview In a fun and informative way, this revised classic shares biblical insights to a new generation of families. Inside a parent or teacher finds all that's needed to share the basic truths of the Gospel, and to expand that teaching whenever they wish through detailed instructional tips and structured learning. The humorous illustrations are filled with seek and find images, and the text shares God's Word in ways a child can truly understand. 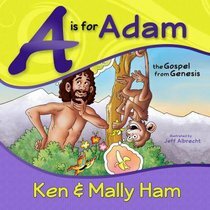 About "A is For Adam"